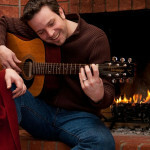 Can you envision human skull fire logs that appear to be actual human skulls amid flames in your fire pit or fireplace? Only at Halloween or year around? 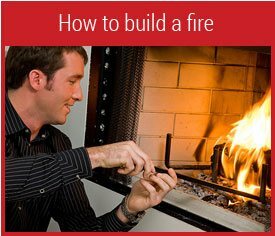 Do you have a friend who would be thrilled to be gifted with life-sized, reusable imitation human skull fire logs? 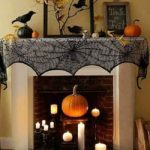 Maybe it takes a special mindset, but you might be surprised at how popular fireproof imitation human skull fire logs are, in fire pits all year and in indoor fireplaces during the Halloween season. 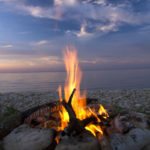 wood fire pits or fireplaces. 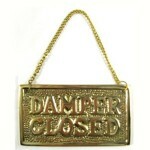 They are not for use in vent-free or vent-less fire pits or fire places. As with anything that’s been within a fire, the human skull shaped fire logs will darken with the residues of combustion (soot) over time. That just makes them increasingly realistic looking! High heat resistant human skull shaped fire log. Image by manufacturer, Myard. Each fireproof human skull fire log weighs about eight pounds and appears the size of an adult human’s skull. Just like real human skulls, these human fire skull logs vary a bit in size, but are 8 to 9 inches long and 5 to 6.5 inches wide. The lower jaw comes packaged in foam separately in the box, and the pieces snap together. The jaw is designed so it props the skull up into an open-mouthed position. Once assembled and placed within a fire, flames will appear within the jaw opening. Flames will not come through the nose or eyes of theses high heat resistant imitation human skulls, though. 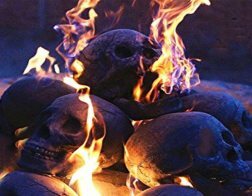 To use the human skull fire logs in a wood fire bowl or fire pit, build a fire with firewood, but before you light it, add one or more of these human skull fire logs. Then sit back and watch the spookiness begin! When in a burning fire, flames flow around the skull and through the jaw opening, creating an eerie sight not easily forgotten. 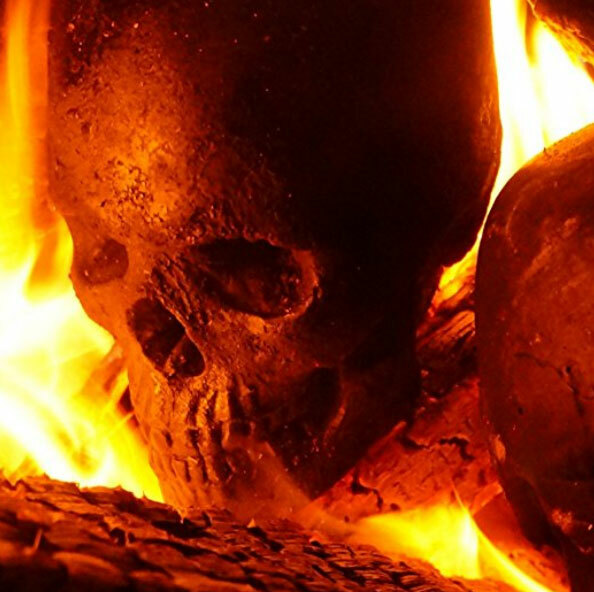 A single human skull fire log centered in a fire pit or fire place is eye-catching. But a pile of 3, 5 or more of them are positively heart-stopping! 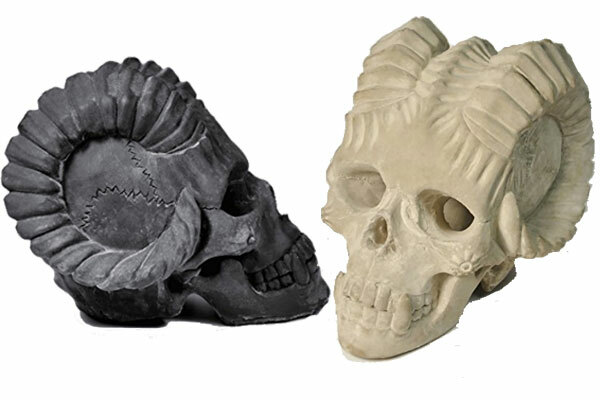 If human skulls don’t offer enough thrills and chills for you, go one step further with black or white demon skull fire logs. On these, the eyes and nose holes are open, so flames shoots through them. lWhich suits your Halloween style, human skills or demon skulls wrapped in flames, lighting your fire pit or fire place? 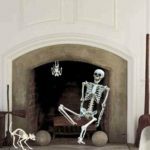 Or would you rather have the skeletons or skull on the mantel or by the fireplace? Where would I purchase these and how much please? 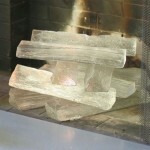 Just click here: http://amzn.to/2x8yR2w for these awesome skull fire logs!